On Tuesday, the same day it held its education-focused event in Chicago, Apple quietly unveiled new iPhone and iPad case accessories with seasonal colors for spring that match the previously announced Apple Watch bands. The new line includes refreshed colors for iPhone X cases, including the iPhone X Leather Folio in Electric Blue for $99, the iPhone X Silicone Case, now in Lemonade for $39 and the iPhone X Leather Case in Soft Pink for $49. All of these iPhone cases are also available in other colors, with the "classic" assortment that launched with the iPhone 8 and iPhone X still available. 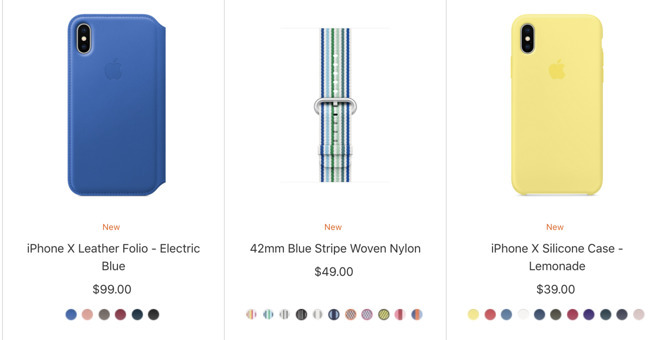 These follow a colorful collection of new Apple Watch bands that were unveiled last week and went on sale today, featuring new colors for the Sport Band, Nike Sport Loop and more. Apple also unveiled seasonal cases for the iPhone 7 around this time in 2017.